It’s officially Spring. 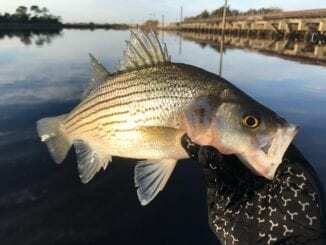 The Spring Breakers have arrived and Kayak Fishing in April is here to help you catch more fish! The last week of March filled with winds up to 20 MPH but the fish didn’t seem to mind. The flats are full of life and here’s how we plan to catch them. April is a fantastic month for chasing shallow water Redfish. As usual we will spend the mornings throwing topwater lures. This will allow us to cover water quickly and find active fish. As the sunrises we will switch it up to soft plastics and start sighting casting fish as they prowl the flats in search of an easy meal. Sight fishing is the most exciting way to catch a Redfish and thats what we spend the majority of the year doing. We prefer to target these fish using 1/4 ounce jig heads and an Ultraviolet Matrix Shad. 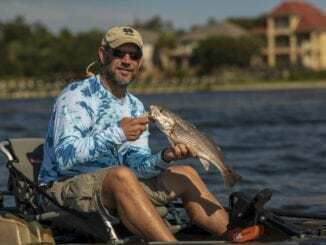 Throughout the Spring, Speckled Trout key in on small baits and shy away from large topwater lures the majority of the time. I prefer to throw 3″ soft plastic lures or small suspending jerk baits. April is a great month for chasing Flounder. They are migrating back inshore and are ready to eat! While targeting Flounder, your lure should maintain constant contact with the sea floor. We prefer to throw a Matrix Shad in Ultra-Violet and pair it was a 5/16-3/8 ounce jig head. Historically, April is as wind as it gets in Northwest Florida. Get on the water and catch some fish! Thanks for reading Kayak Fishing in April. Checkout our Inshore Kayak Fishing Charters.